I did a lot growing up Jewish. I went to two incredible URJ camps, Olin-Sang-Ruby Union Institute (OSRUI) and Kutz. Both camps enhanced my passion for Reform Judaism. I was incredibly involved in everything Oak Park Temple has to offer the community. I taught there from 7th-12th grade and worked at Camp Shalom, Oak Park Temple’s summer day camp. As a teenager, I was in OPTY, Oak Park Temple’s youth group, and also served on the NFTY-CAR board. My first trip to Israel was with Oak Park Temple through a program called Echad al Echad in partnership with a reform community and Kiryat Tivon. That was a transformative experience and that led me to take my gap year in Israel through Shnat Netzer, the World Union for Progressive Judaism’s gap year program. My family is also close with our chavurah, which is a group of about 15 families who all belong to Oak Park Temple. Our chavurah was formed in 1993, just a few weeks after I was born. Over the years, the chavurah has become family. We celebrate most of the Jewish holidays together and secular holidays, like New Years. I even had my Bat Mitzvah with another girl from the chavurah. I did my undergrad at UW-Madison and graduated in 2016. Go Badgers!!! 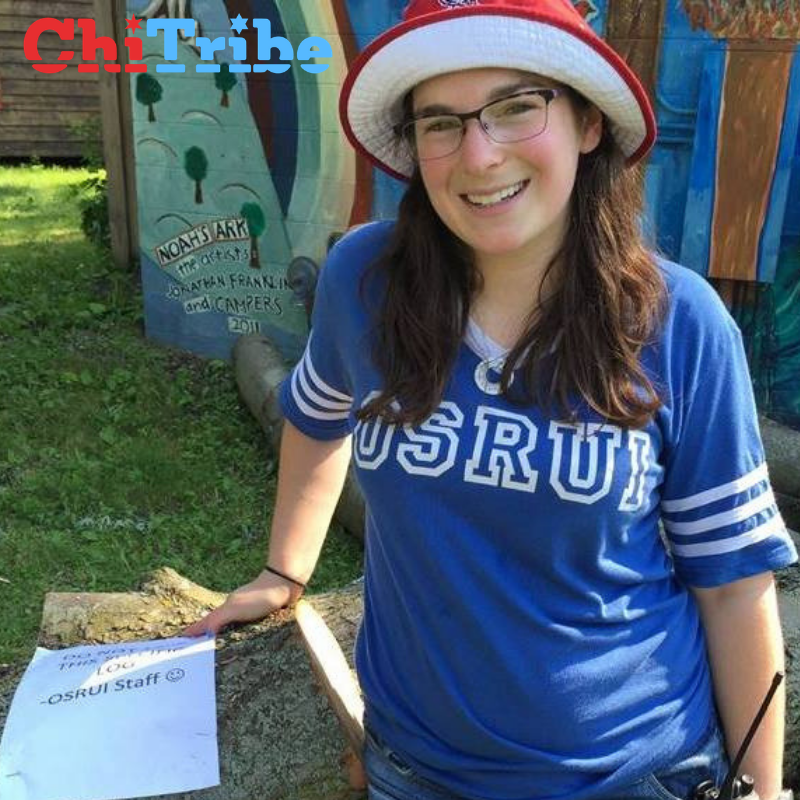 I am Assistant Director of OSRUI and the Regional Director NFTY Chicago Area Region (CAR). 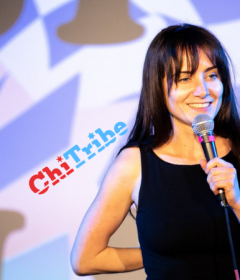 (Mazal Tov Naomi on her new position!). I am currently pursuing a Masters in Jewish Professional Studies from the Spertus Institute. Why is Oak Park Temple such a special place for you and your community? You know, I grew up there. I went to preschool and was president of the temple’s youth group. From all of my experiences, I have learned the true meaning of a lifelong home. 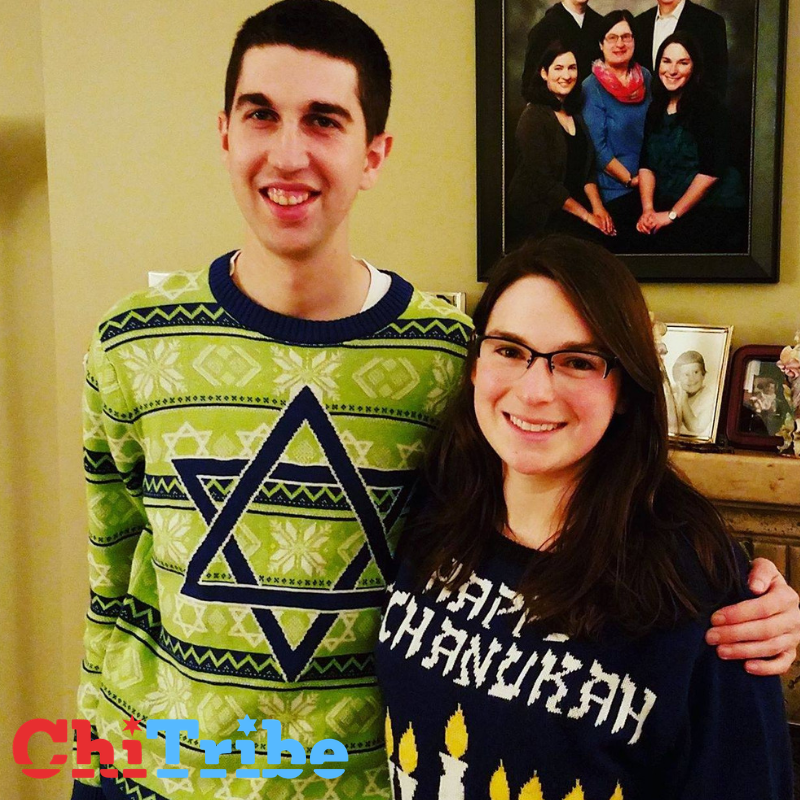 Oak Park is special because there is not a large Jewish community relative to the greater Chicago area and our congregation was made up of 450 families. 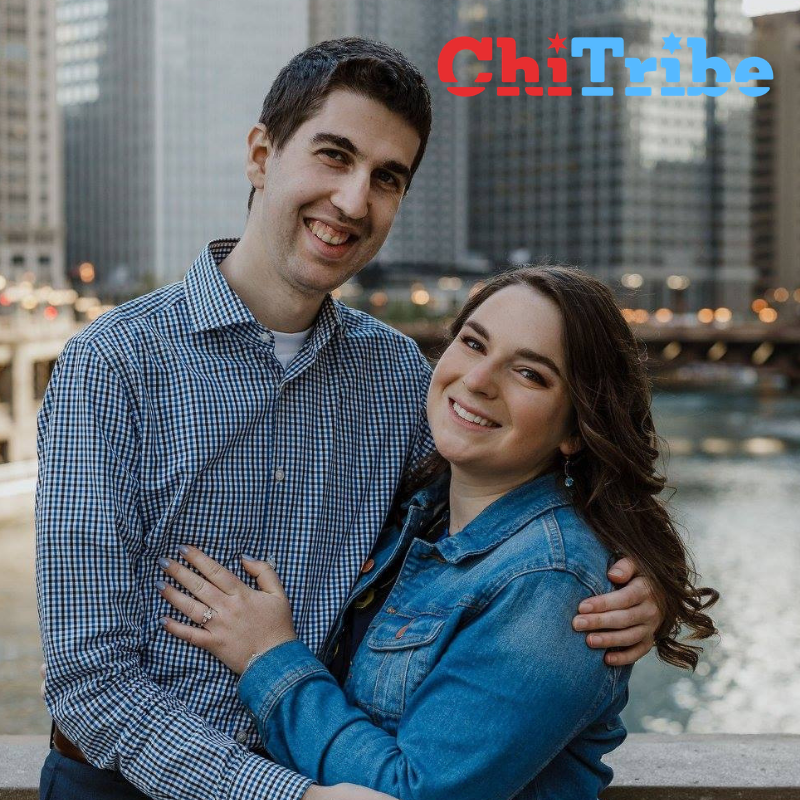 When we have synagogue retreats, they are the largest in the Chicago area because people are ready and willing to come and be a part of the community. For all of us, Oak Park Temple is not just somewhere where we go to have our simchas, but a place that we congregate and find home. I really love to travel and spend time with friends exploring new parts of Chicago. This past summer I attended JCC’s Shabbat on the Lake at the Lurie Garden, which was fantastic! I had a blast with my friends in the Butterfly Garden and enjoyed enjoying Shabbat dinner with so many Jewish young adults from Chicago. I really like shabbat on the lake! When everyone is together, that is my favorite time. So we know you are working on planning and spreading the word about Oak Park Temple new initiative to bring Jewish life to the West side of the city. Tell us the behind of the scenes of Jewish life on the west side for a passionate Reform Jew like yourself. 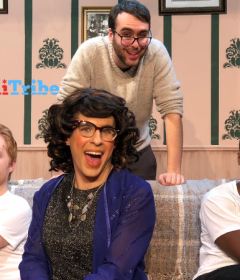 How did this fusion of Oak Park Temple and Moishe House Wicker Park come to life? In my opinion, there are no strong meaningful spiritual opportunities on the west side for Reform Jews. In the Logan Square area, there are no synagogues. Logan Square is actually only 25 minutes away from Oak Park, which is one of the reasons I chose to live in the area. For years, Oak Park Temple has identified this spiritual gap and finally we are launching a new initiative. 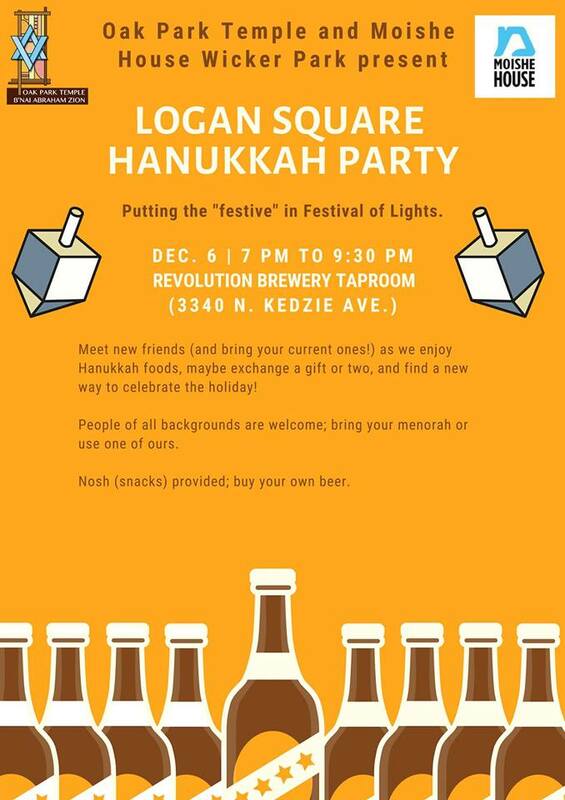 The Hanukkah party at Revolution Brewery this week is only the beginning! 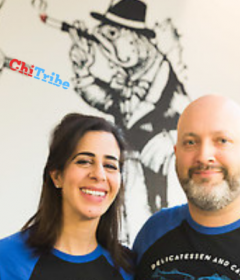 There is a new rabbi on staff named Rabbi Daniel Kirzane and part of his portfolio is to do outreach to the western part of the city including Wicker Park, Logan Square, and the greater Bucktown area. 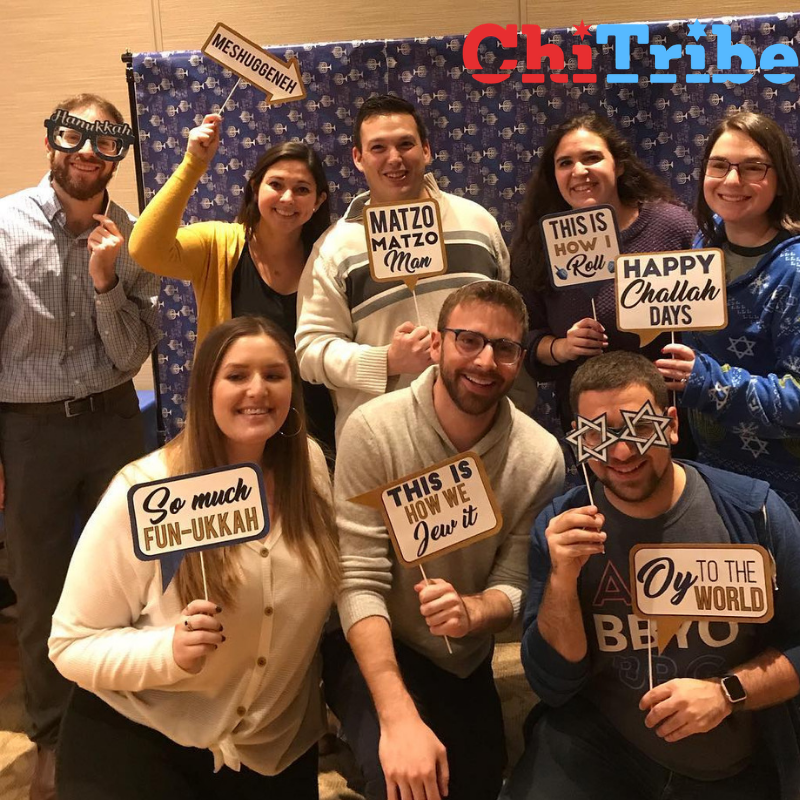 Already, there is a small yet mighty group of young adults who want to see a synagogue presence on the West Side because we are seeking stronger and deeply impactful Jewish experiences. Oak Park Temple and I want to provide that service for the Jews on the west side. What is the event we should know about? First of all, Revolution is based in Logan Square and already a common place that people know of and love. You can bring in your own food and it is exceptional for community gathering. There are always people of all ages and socializing is super easy. Also west side advantage, Revolution is very close to the blue line which is how we gather on the westside. For sustainability, Revolution put the beer in cans instead of bottles to preserve it for longer. Every time I go, they have expanded even more. Revolution makes me feel proud in the Logan Square of how it is growing. What are your top 3 Chicago Breweries? My favorite way to spend Shabbat is with my friends around the table. Of course, good challah maybe some cards against humanity, Settlers of Catan, and the essential good IPA beer in hand. What do you think is a major misconception about Reform Judaism? I think many people think reform jews are lazy or not observant, or that we only go to synagogue for a bar or bat mitzvah. Actually, I was actually raised in a reform bubble where I never experienced these misconceptions. When I left the bubble, I started to realize all of the stereotypes that my community breaks about reform and progressive Jews. I just want more Jewish peers to know that reform Jews come in all different forms, and our generation really cares about enduring Jewish life. When the tribe gathers…we feel at home. Of course, Joe Winner for helping make this Oak Park Temple/West side fusion possible and Rabbi Kirzane for his work and excitement!